Being called a nice guy is sometimes a backhanded compliment, and by almost all accounts, Georgia football coach Mark Richt is a nice guy. He’s also cunning enough to survive in a cutthroat business. The problem is, he does not thrive in the biggest games. He wins a lot of games and has a pleasant personality, so he still has a job. Being called a nice guy is sometimes a backhanded compliment, and by almost all accounts, Georgia football coach Mark Richt is a nice guy. He’s also cunning enough to survive in a cutthroat business. The problem is, he does not thrive in the biggest games. He wins a lot of games and has a pleasant personality, so he still has a job. Nick Saban is his opposite. He’s not happy unless he’s cranky. It’s as if a bird craps on his shoulder each morning he leaves the house. But the Alabama coach wins the big ones, so who cares if he’s not a nice guy? For those who succeed, being called a jerk can be a compliment. Saban has been called a lot of names, but he has not been labeled an underdog in six years. Until now. Richt is the favorite against Saban on Saturday, and something seems wrong about that. Edwards might have exaggerated the value of the coaches, but his point is on target. Saban has won four national championships, so his public perception is powerful for a reason. 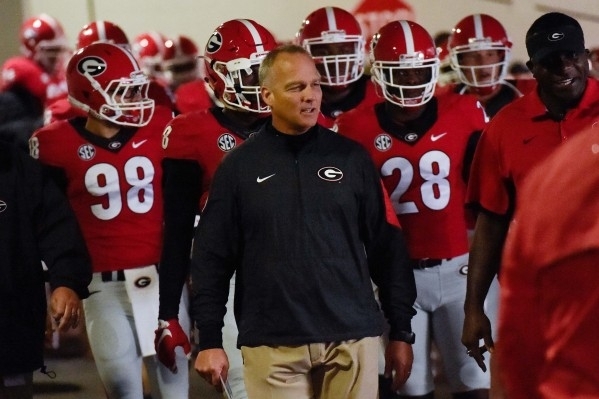 Richt, who has not won an SEC title since 2005, is perceived as weak for a reason. On the Richt scale, this is arguably his biggest game. The Bulldogs, unbeaten contenders for the College Football Playoff, are 2-point home favorites over the one-loss Crimson Tide, a team crippled by poor quarterback play. If there is a time to get Saban, this is it. Alabama’s 72-game streak of being favored is probably ending unless cash pours in on the Crimson Tide before kickoff. It will be pouring, if only because the forecast calls for about a 100 percent chance of rain in Athens, Ga. It has not happened due to Georgia looking better on paper. The Bulldogs are 4-0 after running over Louisiana-Monroe, Vanderbilt, South Carolina and Southern. Greyson Lambert has completed 76.5 percent of his passes with seven touchdowns and no interceptions. Nick Chubb, one of the nation’s top running backs, has 599 yards and six touchdowns. But how much weight do the numbers — compiled against paper-thin opposition — really hold? The Crimson Tide crushed Wisconsin, Middle Tennessee and Louisiana-Monroe while losing 43-37 to Mississippi. Alabama’s starting quarterback, Jake Coker, is barely holding onto his job, and the offense he led converted just 2 of 13 third downs against Monroe last week. If you watched that game, you were not impressed. “At the quarterback position, Saban is still experimenting and he hasn’t found the right formula yet,” Avello said. Alabama does have an elite running back, Derrick Henry, and a defense far stronger than anything Lambert and Chubb have seen this season. In the rain, the Tide will try to roll with Henry and their defense. The Bulldogs know Chubb is for real, and they are about to find out about Lambert, who is not as good as his numbers suggest. Saban hates spread offenses mostly because his defenses struggle to stop them. Mississippi spread the field for Chad Kelly, who ripped the Tide for 341 yards passing on just 18 completions. But this is the type of game Saban can handle because Georgia runs a pro-style offense. Kelly, who started his career at Clemson, could be the SEC’s most talented quarterback. Leonard Fournette of Louisiana State is probably the nation’s best running back. There is no doubt that Tennessee coach Butch Jones has become the league’s worst game manager, even eclipsing a certain LSU coach. Jones’ buffoonery — his misuse of timeouts and failure to go for a 2-point conversion with a 12-point fourth-quarter lead, among other mistakes — was the sole reason the Volunteers folded in a 28-27 loss at Florida last week. “Jones is making Les Miles look like Einstein,” Edwards said. In the SEC this week, Edwards (BrianEdwardsSports.com) likes Arkansas as a 6½-point ‘dog at Tennessee and Vanderbilt as a 1½-point ‘dog at Middle Tennessee. I’ll roll the dice with the Tide in a game that could eliminate them from the four-team playoff on the first weekend of October. Saban is so rarely an underdog for a reason, and the last time he was, he won in a blowout. Iowa (+7) over WISCONSIN; Alabama (+2) over GEORGIA; Oregon (-7½) over COLORADO; Washington State (+18) over CALIFORNIA; Unlv (+6½) over UNR.